At our manufacturing plant, Aksh has all the facilities to create a variety of transparent melt & pour soap bases. Aksh has invested substantial capital in building a first class manufacturing facility, which is centrally located in the busy part of Mississauga. 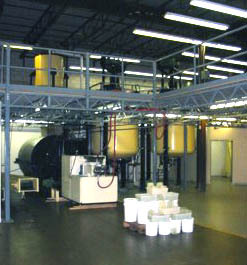 The plant production equipment is of the highest order where the current products can be made and packed. All quality measures are incorporated right at the manufacturing stage, leaving no room for any production output flaws. 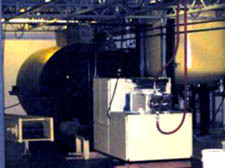 The plant and equipment used currently are multiple jacketed blenders, high temperature reactors, settlers, extruders, boilers, dryers, flakers, and interconnected with a train in operations with SS 304 pipelines. Most of the plant process equipment is of SS 304 grade including process valves/pipeline & the reaction vessels. Create naturally beneficial and environmentally friendly products. To continue to be a preferred quality supplier for the personal care industry. Our capacity to manufacture will reach 600 metric tonnes of soap each month, in all three shifts, which means that we can produce over 12 million pounds of soap base in a year! This statement alone will take us to being one of leading, largest transparent soap manufacturing company in North Americas. Our capabilities range from making a smaller batch size of 4000 Lbs to 8,000 lbs & multiple batch sizes of up to 16,000 pounds at any given time per shift basis. Each production batch taken can be custom designed to suit the customer in terms of any variations needed with regard to the formulations. Our spacious manufacturing facility also has a warehouse where the daily production is housed. Other than this, we have two other larger sized warehouses where both the raw materials and finished products to be dispatched are stored safely. Moreover, this facility is located within the sphere of diverse buzzing activity. This means that any sudden requirement can be taken care of almost immediately. In the current scenario, Aksh can deliver over 12 million pounds of soap base each year. Specifications and variety will not be an issue at all. Aksh believes that to produce a good product, experience and skills are the foremost criteria. To cater to its customers faithfully, Aksh has a fully trained and skilled workforce; each employee is a specialist in his field. In fact, most of the staff is highly skilled chemical engineers, each of who is more than well versed in all the activities that Aksh is involved in to today. To support the manufacturing, Aksh has a well-equipped in house laboratory facility. All tests are done in house and while the operation is in progress, such that any corrective measures can be affected almost instantly. This saves substantial effort, time and resources and this is one of the main factors that grants Aksh the competitive edge in the pricing of its products. Indirectly, this means that our customers actually pay less for the untiring efforts Aksh takes in maintaining its highest standards of production. Testing of all incoming raw material is done in the Quality Control laboratory both physical & visual tests are performed. We base & rely on Certificate of analysis from the suppliers of its integrity. We buy from reputed manufacturers only & document all incoming supplies. In manufacturing we analyze for the appearance, foaming properties, absence of foreign matter, moisture, melting point free acid/ free alkali total fatty matter. First three tests are physical tests and tests & the rest are based on AOCS (American Oil Chemist Society) standard test procedures.